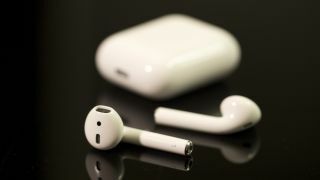 It was the question on everyone's lips the moment Apple AirPods were announced: What happens if you lose one? The answer, up until day, was "buy a replacement," but Apple just released iOS 10.3 beta for developers, and nestled inside the Find My iPhone app is a feature called "Find My AirPods". While Find My iPhone locates a lost handset using iCloud and separate app, Find My AirPods can't do so since Apple's wireless earbuds operate by Bluetooth. Misplaced AirPods, then, can only be pinged if an Apple device - which also includes baked-in GPS - is nearby. The range for AirPods' Bluetooth can extend between 5-10 meters, according to 9to5Mac. Your vagabond bud's general location will pop up on a map inside the app, but you'll also have the option to play a sound from the AirPod to track it down. Just don't have the other AirPod inserted in your ear when you press play, for the sake of your hearing. iOS 10.3 should make its way to the general populace soon, so if you've lost an AirPod and don't want to pay $69/£65/AU$99 for a new one, sit tight. Help is on the way.